On Tuesday, August 8th 25 organic potato breeders, farmers organisations and retailers in the Netherlands signed the covenant 'Accelerated transition to robust potato varieties'. With this covenant, the organic sector wants to provide a sustainable solution to the most devastating potato disease - potato blight ( Phytophthora infestans). Bionext, the Dutch umbrella organisation for the organic sector, has taken the initiative for this. The direct reason for the agreement is the large-scale damage this disease caused in 2016 to the organic potato cultivation. Potatoes are susceptible to late blight and natural fungicides are not available for Dutch organic growers. 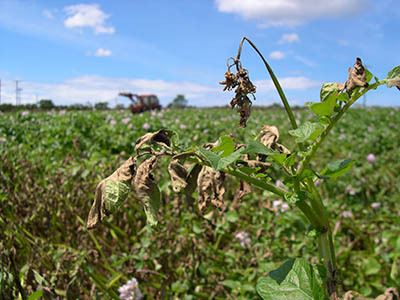 To prevent future disasters, the availability of resistant varieties needs to improve. To speed up this process, the covenant partners agreed to give these robust varieties priority: in breeding, in production of seed potatoes , in potato cultivation and in sales. In this way it is possible to scale up, step by step, to 100% of robust organic potatoes by 2020. At the moment, there are six resistant potato varieties available on shop shelves in the Netherlands. This number will grow to probably 10 to 12 varieties in the next few years. By 2020 there will be a wide range of robust organic potatoes available for consumers in the various supermarkets and organic stores. Bionext will monitor the progress, yearly. Bavo van den Idsert, director of Bionext: "We are proud that we could get all the parties on the same page. This is a good example of cooperation in the supply chain. With this covenant, the organic potato sector takes the lead in making the potato farming more sustainable." Bionext, the Dutch chain organisation for organic agriculture and food and its members Biohuis, BioNederland and the Organic shop association. Retailers: Albert Heijn, Jumbo Supermarkets, Ekoplaza/Udea, Natural Stores/Natudis, Estafette Odin B.V.
Organic farmer organisations: Bdeko, Biowad, Association of Organic Farmers South West, Nedato cooperative, Dutch Organic Potato Pool.